A new understanding of why synthetic 2-D materials often perform orders of magnitude worse than predicted was reached by teams of researchers led by Penn State. They searched for ways to improve these materials' performance in future electronics, photonics, and memory storage applications. Two-dimensional materials are films only an atom or two thick. Researchers make 2-D materials by the exfoliation method — peeling a slice of material off a larger bulk material — or by condensing a gas precursor onto a substrate. The former method provides higher quality materials, but is not useful for making devices. The second method is well established in industrial applications, but yields low performance 2-D films. The researchers demonstrated, for the first time, why the quality of 2-D materials grown by the chemical vapor deposition method have poor performance compared to their theoretical predictions. They report their results in a recent issue of Scientific Reports. "We grew molybdenum disulfide, a very promising 2-D material, on a sapphire substrate," said Kehao Zhang, a doctoral candidate of Joshua Robinson, associate professor of materials science and engineering, Penn State. "Sapphire itself is aluminum oxide. When the aluminum is the top layer of the substrate, it likes to give up its electrons to the film. This heavy negative doping — electrons have negative charge — limits both the intensity and carrier lifetime for photoluminescence, two important properties for all optoelectronic applications, such as photovoltaics and photosensors." 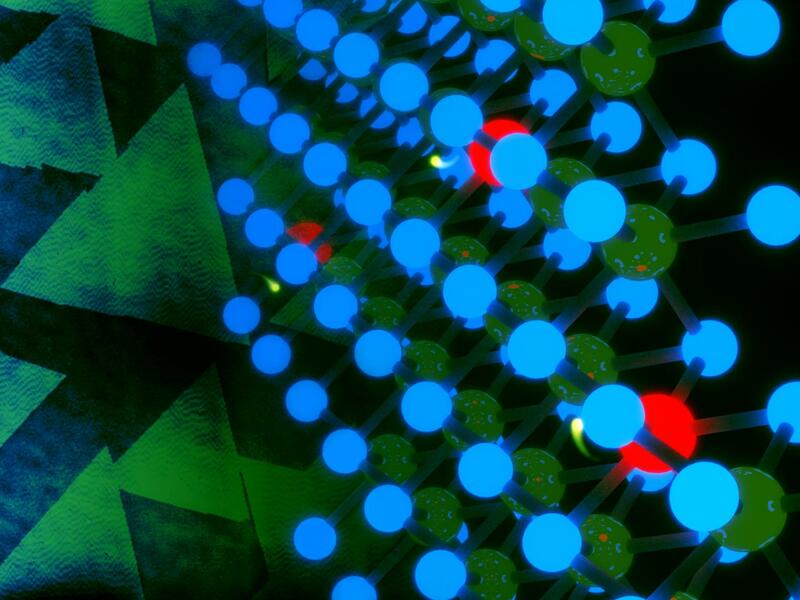 In related work, a second team of researchers led by the same Penn State group used doping engineering that substitutes foreign atoms into the crystal lattice of the film in order to change or improve the properties of the material. They reported their work this week in Advanced Functional Materials. "People have tried substitution doping before, but because the interaction of the sapphire substrate screened the effects of the doping, they couldn't deconvolute the impact of the doping," said Zhang, who was also the lead author on the second paper. Using the oxygen-terminated substrate surface from the first paper, the team removed the screening effect from the substrate and doped the molybdenum disulfide 2-D film with rhenium atoms. "We deconvoluted the rhenium doping effects on the material," said Zhang. "With this substrate we can go as high as 1 atomic percent, the highest doping concentration ever reported. An unexpected benefit is that doping the rhenium into the lattice passivates 25 percent of the sulfur vacancies, and sulfur vacancies are a long-standing problem with 2-D materials." "The goal of my entire work is to push this material to technologically relevant levels, which means making it industrially applicable," Zhang said. Contributors to the Scientific Reports paper, "Deconvoluting the Photonic and Electronic Response of 2-D Materials: The Case of MoS2," are Zhang, Brian Bersch, Ganesh Bhimanapati, Baoming Wang, Ke Wang, Michael Labella, Teague Williams, Amanul Haque and Joshua Robinson, all of Penn State; Nicholas Borys, Edward Barnard and P. James Schuck, the Molecular Foundry, Lawrence Berkeley National Laboratory; and Ke Xu and Susan Fullerton-Shirey, University of Pittsburgh. Contributors to the Advanced Functional Materials paper, "Tuning the Electronic and Photonic Properties of Monolayer MoS2 via In Situ Resubstitutional Doping," are K. Zhang, B. Bersch, Natalie Briggs, Shruti Subamania and J.A. Robinson, Penn State; Rafik Addou, Christopher Cormier, Chenxi Zhang, Kyeongjae Cho and Robert Wallace, University of Texas at Dallas; Jaydeep Joshi and Patrick Vora, George Mason University; and K. Xu, Ke Wang and S. Fullerton-Shirey, University of Pittsburgh. Joshua Robinson is associate director of the Center for 2-Dimensional and Layered Materials (2-DLM) and co-director of the NSF-I/UCRC Center for Atomically Thin Multifunctional Coatings (ATOMIC), both at Penn State. The National Science Foundation, the Semiconductor Research Corporation, Defense Advanced Research Projects Agency, the U.S. Department of Energy, the Nanoelectronics Research Initiative, and the National Institute of Standards and Technology supported portions of this work.